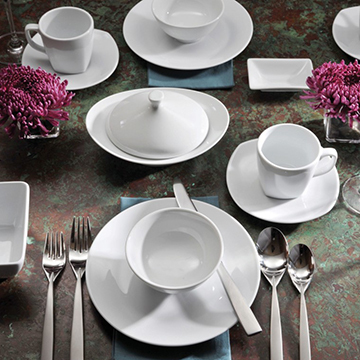 Oneida Sant' Andrea Fusion Dinnerware is part of a globally inspired collection that offers a multi-cultural assortment of specialty items including several pieces crafted in contemporary geometric shapes, as well as Asian-oriented serving accessories. Ideal for blending a variety of international cuisines in creative combinations. Your tabletop is the foundation for a great meal. So you'll want your presentation to be as fresh and unique as the food you are serving. Whether you are a five-star luxury hotel or a comfortable eatery, your customers deserve a perfect dining experience. With Oneida's more than 100 years of experience, you can count on them for unparalleled quality, service & knowledge in the food service industry.